The Delusional Blogger: How the Iranian Cyber Army is Connected to the Conspiracy! How the Iranian Cyber Army is Connected to the Conspiracy! As many of you already know, yesterday (December 18th, 2009) twitter was hacked by the Iranian Cyber Army. The hack redirected twitter users to a website run by the Iranian Cyber Army. 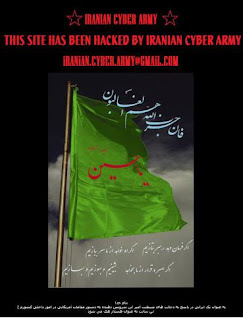 Upon seeing the website of the Iranian Cyber Army the first thing I thought was what idiots would hack a website to deliver a message, to the U.S., in a make believe language (since then I have learned that the hackers in fact used a "real" language). Deciding these hackers are not idiots I decided to translate the message (maybe they really had a good cause), after spending five hours yelling at my computer and one hour making Chewbaca sounds I finally managed to translate the message. The message said "U.S.A. Think They Controlling And Managing Internet By Their Access, But They Don’t, We Control And Manage Internet By Our Power, So Do Not Try To Stimulation Iranian Peoples To….". Now I don't know about you, but I would think that any cyber army, even the Iranian Cyber Army, would at least know how to type in a non gibberish language without coming off as idiots. I mean a little bit of their message might of been lost in translation, but not that much. So either this is a cyber army of idiots or there is a secret code hidden within this message? It took many hours of research, and almost two mountain dews to finally stumble across the truth, but I found the truth none the less. Just when I was about to give up and admit the Iranian Cyber Army was an army of idiots I found something truly astonishing. The language used in the Iranian Cyber Army webpage was a highly secret Arabic language used in the early 1990's called G' speake. It turns out G' speake was originally invented because words like dog, fizzel, bedizzel, fo shizzel, and homey boyyyyeee had no meaning in many Arabic languages, and young Arabic rappers needed some random words to throw into their songs (this is because these words earn rappers street cred). Two years after it invention the language became a full blown fad, and just two months later people realize that language sucked. Anyways long story short G' speake failed, but it seems the Iranian Cyber Army has found a way to use it, in order to transmit secret messages to the G's of the world. You see when translated into English from G' speake the message on the Iranian Cyber Army's twitter hack reads "The Zombie Army is riding on us in 2012 dog, prepare the P to the ackage my boyyyyyeeees of the worldizzel". Could this be a message to other G's of the world to take up arms against the coming zombie attack, is the Iranian Cyber Army filled with idiots, will the zombies invade? I honestly don't know, but one thing is for certain the Iranian Cyber Army just might be on our side in the war against the zombies, and if their not at least we know they are too stupid to do any real damage. If anyone out there reading this has any more info regarding the Iranian Cyber Army and their battle against the Zombies please let me know. It is vital that we determine the true intent of the Iranian Cyber Army, they just might be able to stop the zombie apocalypse. After all they are a cyber army, which is better then no army, however I would prefer a real army, anyway we need all help we can get. Until next time this is Delusional signing off. Stay wary people, fosizzels sake.